For the owners of commercial properties, metal roofing is easily one of the most affordable roofing solutions on the market. Metal roofing is both tough and easy to maintain, no matter what kind of weather conditions you may anticipate. These are the most significant reasons property owners and managers are likely to choose metal roofing for their commercial property. One of the benefits of using metal roofing on your commercial property is it’s longevity. 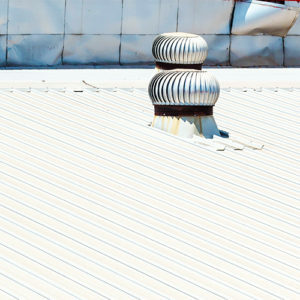 Unlike commercial roofing solutions that only last 10 - 20 years, metal roofing can last anywhere between 30 to 50 years. Of course, this can depend on the material you’ve selected with your John Beal Roofing contractor. A part of the reason why commercial metal roofing lasts is that it is very durable. Metal roofing can take a beating from Mother Nature; whether it’s rain, snow, hail, or even lightning! With metal roofing, you can rest assured that you are protected from almost anything nature can conjure. The same factors that make metal roofing so durable are the same that make it so easy to maintain. While other roofing systems require frequent care and attention, metal roofing mostly needs the spray from a hose from time to time. Just enough care to remove dirt and debris, in order to keep it looking its best. Beyond that, metal roofing is largely self-sustaining. Of course, there can be downsides to installing a metal roof on your property as well. For instance, hail and rain can create a significant amount of noise when falling onto a commercial metal roof. If your property is an office or multi-family building, this might be problematic. Tenants who are sensitive to noise may have difficulty sleeping or concentrating on their work. If you’re interested in installing a metal roof on a manufacturing facility, shed, or warehouse, these downsides will not be a significant issue. Talk to your John Beal Roofing contractor about will be best for your property. Another issue with metal roofing is that it can sustain damage from hail or other significant debris. This will depend on the type of metal roof you choose to have installed on your property, as some of the softer metals will be prone to dents when pelted by large hail stones. Some metal roofs can be vulnerable to oxidization and rust, as well, but this will be determined not only by the type of metal used, but also on the quality of the installation. Another reason why you should only choose to work with qualified and experienced contractors, like those at John Beal Roofing.